So the weather threw us a bit of a curve ball – from Klaasenskop to Pile K and probably Reserve Peak and further – covered in cloud, shrouded in mist. No sunset view over Orangekloof and Hout Bay, no full moon or eclipse sighting, not even a peak of the sunrise of 2010. It was all there, but not for us to see. Good humour, good company, good food and a warm and comfortable cottage saved the day, supported by a good few bottles of J.C. le Roux. At midnight we stared into the impenetrable fog, heard the sound of fireworks in the city below and celebrated the arrival of 2010 anyway. An hour or two later and some good conversation we retired to bed, with ever hopeful Kevin setting the alarm for 5 a.m. sunrise call. It went off we looked at the white wall from the deck and returned to the comfort of our duvets and pillows. Breakfast was late and leisurely, with a bit of bubbly to go with the Mango Juice. Once on top there is no avoiding a stroll on the Back Table, cloud or no cloud. There are definitely dams there, quite spectacular views in clear weather, even a railway museum, but regrettably the cloud was stubborn and the view of the Atlantic seaboard was not going to open up. Even the eventual descent down Skeleton Gorge was foggy until three quarters of the way down. Kirstenbosch Gardens and a picnic lunch was welcome before re-uniting with luggage and cars. Thanks for your help Kevin and Afruka Eco Tours. Maybe 2011 will be better. We will definitely be there. Slackpacker SA 02 January 2010. P.S. To cap it all camera battery packed up – photographs from the others will follow. 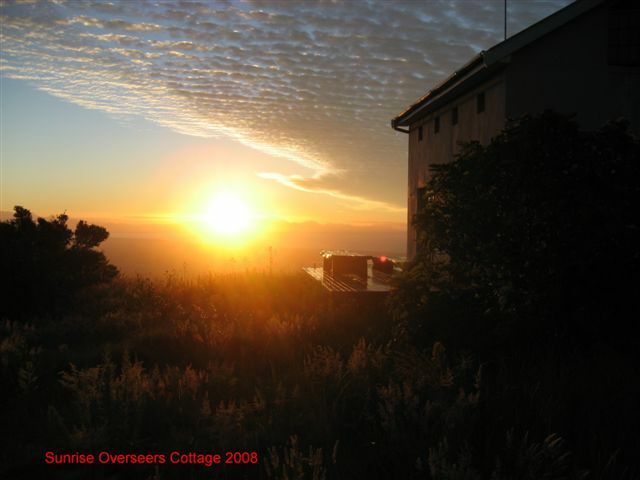 New Years Eve overnight special at Table Mountain’s Overseers Cottage (Table Mountains best kept secret) 31st December 2009. Hike up from Kirstenbosch Gardens, led by a Table Mountain guide – a moderate two and a half hour walk. 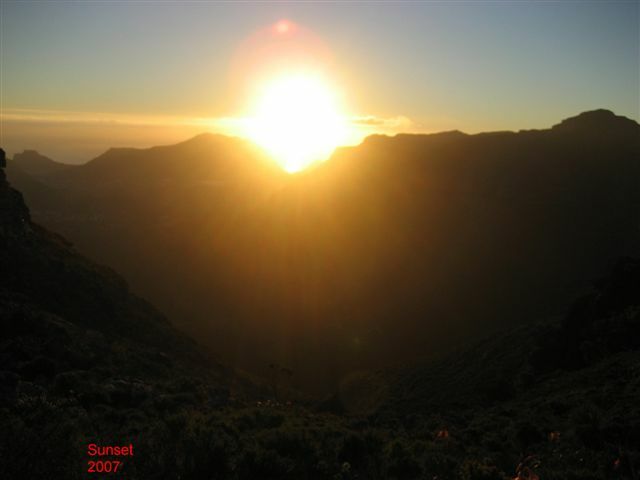 Watch the sun set on 2009 overlooking Hout Bay, dine on a special New Year menu, with the full moon looking down. Welcome the New Year overlooking Kirstenbosch Gardens and the Southern Suburbs, with fireworks going off below. 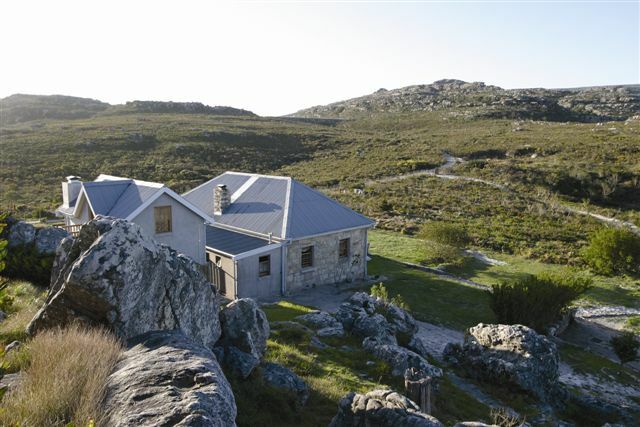 Sleep in luxury comfort and wake up to the sunrise on 2010 overlooking the distant mountains and False Bay.